All over the world, historic monuments made of stone have been standing for millennia. Given that they were raised before the concept of writing extensive logs caught on, there are no records from builders or nearby residents as to the purpose of each monument. Despite this, clues in the structures themselves may tell us why they were raised. Dolmens were used to bury the dead while some standing stones “worked together” with other monuments to help early peoples chart the stars. Some sites, however, have histories so shrouded in mystery that it’s hard to say what they were truly for. We have hints, clues, and archaeological proof that something was happening at these locations but no decisive evidence to tell us the full stories behind these mysterious sites. Here are 10 such puzzling monuments. What do you think they were for? 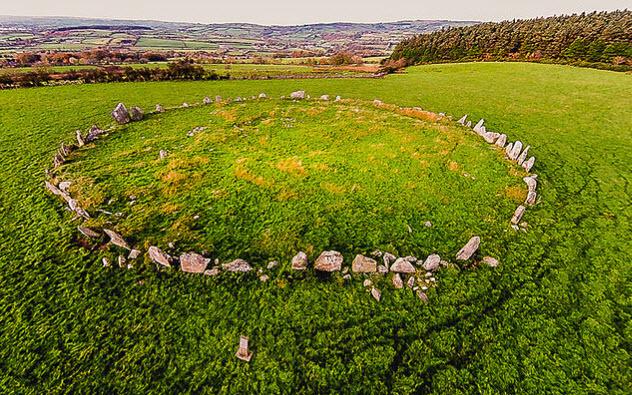 Found in the North West of Ireland near the town of Raphoe, the Beltany Stone Circle is made of 64 stones spanning 45 meters (145 ft) in diameter with the entire setup encircling a mound. It’s thought that the stones were raised around 1400 BC to 800 BC, with the average height of the stones being about 2 meters (6 ft). The festival involved lighting fires on top of hills to rejuvenate the Sun, so it might tie into that. Other theories state that the circle looks similar to the circles at Carrowmore Cemetery, hinting at a possible purpose during burial procedures. Some claim that the entire setup was built to mark a burial cairn. Although archaeological evidence for their purpose hasn’t been found yet, the locals have their own tales to share. 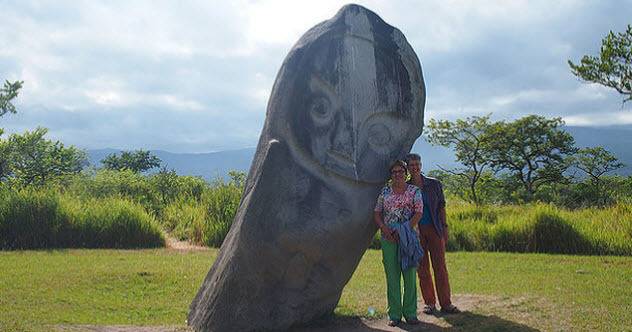 Some believe that the megaliths herald back to the days of human sacrifice, some say that they exist to ward off malevolent spirits, some state that they’re criminals turned to stone, and some believe that the stones have the ability to move on their own. Regardless, given that the megaliths are made from stone not found in the area, they’re definitely very mysterious. 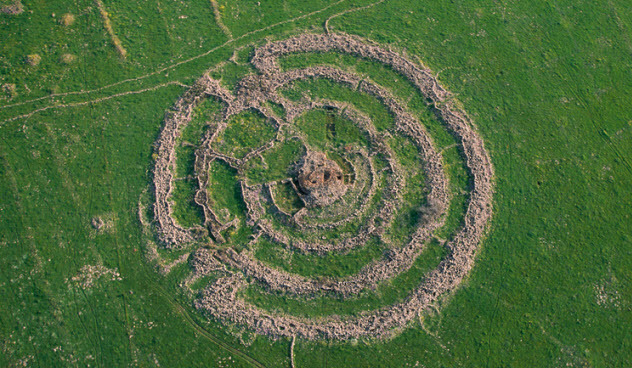 Also known as the “Wheel of Giants,” Rujm el-Hiri is a large, circular, megalithic structure near the Sea of Galilee. It appears as a giant stone wheel with inner rings and “spokes” that connect everything. Right in the middle of the ring, almost like a bull’s-eye, is a place for burial. Not only are archaeologists unsure that the burial site was made at the same time as the wheel but further investigation of the site revealed that no burials actually took place in it. It’s thought that valuable artifacts were once here because there is proof that looters hit the site, including a Chalcolithic pin potentially dropped by a looter. As for proposed functions, archaeologists don’t believe it was a place built for dwelling or defense. Some believe that it was a calendar given how the sunrise on the solstices align with the entrances of the wheel. One popular explanation points to the burial site, claiming that people were placed there to undergo excarnation, the act of removing the flesh from a human body. The bones would be moved to another site, which explains the lack of evidence that a burial took place. However, it would be hard, if not impossible, to prove that this actually occurred at Rujm el-Hiri. Regardless, the site has been estimated to have taken 25,000 working days in total to build. Whatever purpose it was meant to perform, it was obviously very important. 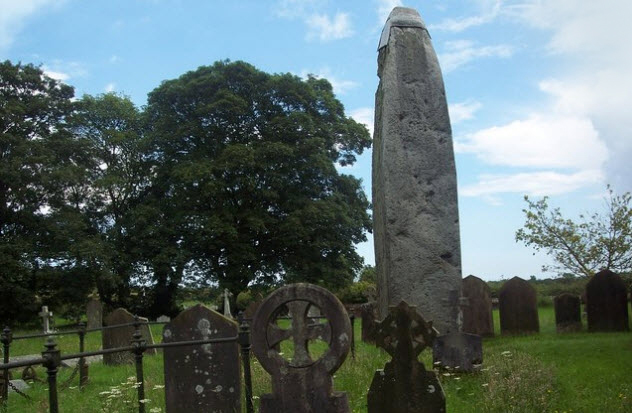 Rudston Monolith, the highest standing stone in all of Britain, can be found in the village of Rudston in a church’s graveyard. It is an impressive 7.6 meters (25 ft) tall and was probably raised around 1600 BC. There are theories that the stone named the village rather than the other way around. Given its age and prominence in the village, it’s only natural that legends of its origin are known among the locals. One legend makes a claim that the monolith was a spear crafted by the Devil as he made an attack against the church. Unfortunately for him, his aim was off-kilter and the spear ended up in the graveyard instead. Another legend claims that it was an attack by more protective forces—a spear of stone thrown at someone trying to deface the graves. As for archaeological evidence of its origins, Sir William Strickland dug around the site to try to uncover some more evidence. He discovered that the monolith may have half of its total length buried underground, bringing its height to double what we see. He also found a huge number of skulls, potentially hinting at a sacrificial or religious use. Despite this, there’s no defining evidence to tell us what went on at Rudston. 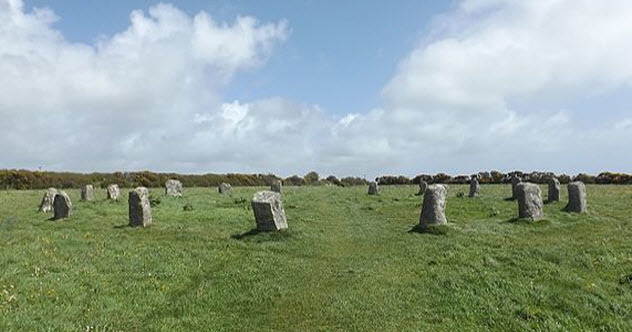 Located in Cornwall, the Pipers and the Merry Maidens are separate megalith monuments. The Pipers consist of two standing stones, while a small distance away, the Merry Maidens form a stone circle. The circle is perfect, bar a deliberate entrance made on the east side which may hint at an astronomical purpose. The immediate area around these stone formations is littered with burial sites, which may hint that the stones had some relation with spiritual or burial procedures. Whether it served an astrological or burial purpose (or potentially both) is unknown. So why are two stone formations mentioned in one entry? When it comes to mentioning either, it’s hard not to mention the other due to the local legend that ties the two together. It states that two pipers were playing music for a dancing circle of maidens on a Sunday, an act that broke the Sabbath. Realizing what they did, the Pipers tried to run before anything bad could happen, but it was too late. They and the merry maidens were turned to stone for their transgressions. 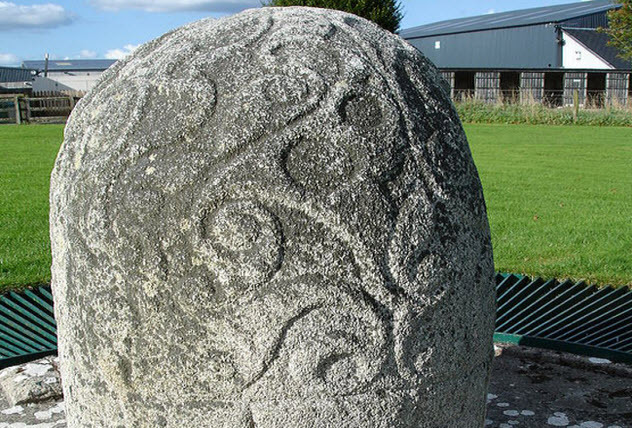 A beautifully sculpted stone currently in County Galway, Ireland, the Turoe Stone was once located within the Iron Age ring fort called the Rath of Feerwore. We say “once” because it has been relocated since then to sit outside the Turoe House. The art on the stone sports a Celtic design called “La Tene,” and it’s one of the finest examples of La Tene in the whole of Europe. So what was it for? People aren’t sure. Given that the stone is in a slightly phallic shape, some sources claim that it might have been used in fertility rituals for blessed births. However, “Turoe” is derived from “Cloch an Tuair Rua” (“The Stone of the Red Pasture”), leading some to believe that the red symbolism points toward sacrifices being made by the Turoe Stone. Others believe that the stone’s true origin was France before being moved over to Ireland. Regardless, it’s a nicely carved stone and a great surviving example of Celtic art. 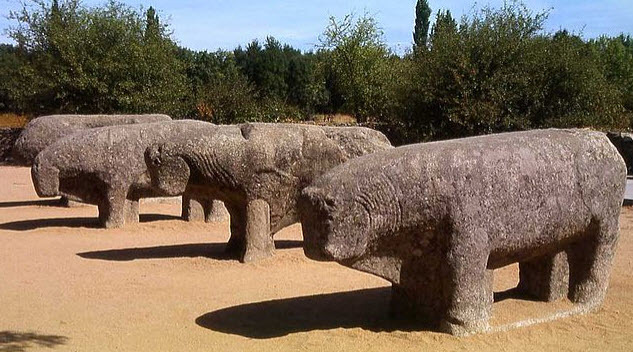 Found in Avila, Spain, the Bulls of Guisando are a strange group of four bull statues carved from stone. They’re part of a group of 400 similarly crafted animals called the verracos and have been around since the fourth century BC. Despite the fact that verracos means “boars,” the statues come in different species such as these bulls. The four bulls are crafted in different poses so that they look like a group of bulls grazing in a field. They’ve obviously been known and discussed for a long time because the bulls have been mentioned in various pieces of literature throughout history, including a 16th-century novel. It’s believed that they once had horns but weathering wore them away. Although they’re historically “at home” in Spain, evidence suggests that the bulls might have been taken to Rome as one of them sports Latin graffiti etched onto it. Not only that but it’s believed that the four bulls were originally built separately from one another before being collected in one spot. Archaeologists aren’t sure why the verracos were made, but there are some hints for their purpose. The verracos can be mostly found in places where they can be easily spotted. Although it’s only natural that stone workers would want to show off their work, archaeologists believe the significance of being in fields and open plains may suggest a religious element. It’s possible that the verracos were used to protect towns and farms from evil spirits. 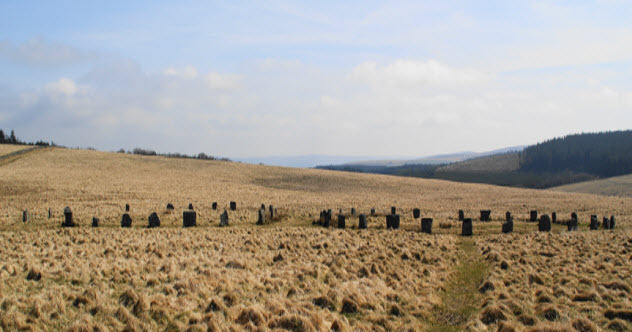 Grey Wethers in Dartmoor, England, is a rare case in megalith structure as it’s not one but two stone rings right next to each other. Both of the circles feature 30 stones, and both of them come close to 33 meters (108 ft) in diameter. Not only that but the circles stand nearly exactly north and south of one another—with only two degrees of difference from the exact orientation. Excavation of the circles revealed a thin layer of charcoal, which implies that the site saw a lot of fire. It’s clear that something was happening within these two circles. The real question is: What exactly was being performed in this strange setup of circles? It’s hard to tell, but several theories have emerged. One states that the circles were used to represent a spiritual gap, with one circle representing those still alive and the other representing those who have passed. Therefore, rituals performed in the “living circle” would symbolize the permeation of the spiritual wall between the living and the recently deceased. This would allow the living to send off, pay respects to, or perhaps try to communicate with those on the spirit side. Others put less emphasis on the spiritual, stating that the two circles represent a ritual that involves a gender divide, with one circle for men and the other for women. Still others believe that the circles could have been used as a meeting place for two neighboring tribes to discuss, trade, and feast. Like many mysterious constructions, Grey Wethers has its fair share of myths. “Wethers” is the old English name for “sheep,” and one such myth tells of a farmer who moved into Dartmoor, only to criticize the selection of sheep at the local market shortly after his arrival. After having several drinks at a local inn, the locals persuaded him that they had a fine selection of sheep for sale that would appeal to his obviously refined taste. They led him to the foggy field where the sheep were supposedly kept, and the farmer saw the silhouettes of the flock. He purchased the sheep then and there, only to awaken the next morning to discover that he had actually purchased the stones of Grey Wethers. 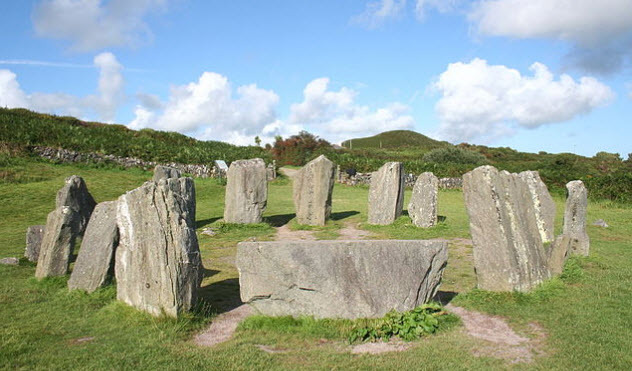 Known as the “Druid’s Altar” among locals, Drombeg is a 17-pillar stone circle. While its exact origins are relatively unknown, there is some evidence that points toward why it was built. One of the stones is oriented so that it matches the winter solstice sunset, potentially hinting at some activity around that time of year. An excavation at Drombeg uncovered something even more interesting: cremated human remains kept within a broken pot. When investigated, the pot showed signs of being deliberately smashed at the time of burial. In addition, the pot was wrapped in a black cloth and buried in the center of the ring with 80 shards of broken pottery, four pieces of shale, and remnants from a pyre. When dated, the burial was put at 1100 BC to 800 BC. No one is sure why the person was buried in such a peculiar way, but the setup does hint at a ritualistic purpose. On top of that, there’s proof that people lived near the circle. Beside Drombeg is evidence of the sites of two huts, complete with their own water trough known as a fulacht fiadh. It’s believed that such troughs were heated by rolling heated stones into the water, which has been proven to bring 265 liters (70 gal) of water to boil within 18 minutes. This trough could have been used for cooking, ritualistic bathing, dying cloth, or even brewing. It’s clear that people—for whatever reason—felt the need to visit or even live near Drombeg for periods of time. 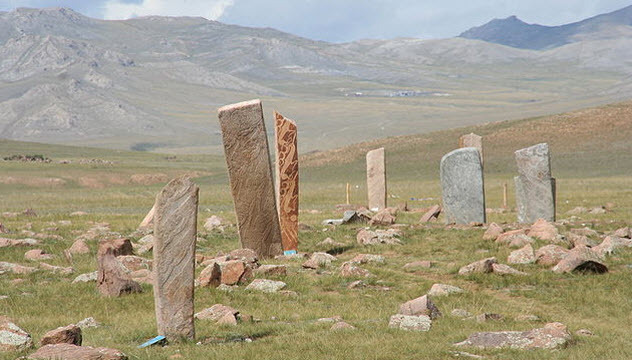 Found all over Northern Mongolia, deer stones are amazing carved megaliths that seem to appear mostly around burial mounds. These megaliths, totaling around 1,200 individual stones, are usually about 1 meter (3 ft) to 5 meters (15 ft) in height and are believed to have been made around 1000 BC. What makes these stones particularly interesting is that reindeer are featured heavily on them. The earlier deer stones depict the reindeer in rather normal stances. But as the years went on, the stones began to depict the reindeer soaring through the sky, which probably gave Santa Claus a good deal of inspiration. Even more curious, the reindeer are shown interacting with the Sun, such as holding it within their antlers. That’s not all the reindeer were interested in, however. The same reindeer were also found on the tattoos of warriors, but these reindeer were interacting with birds. Archaeologists believe that this collaboration of nature between the reindeer, the Sun, and the birds may represent a spirit passing into the afterlife. Spirits go from the ground (reindeer) to the sky (birds) and onward into the heavens (the Sun). As such, these deer may have been made for protective purposes against evil spirits or to help guide spirits into the next life. Either way, the deer stones are a remarkable example of early stonecrafting, whatever their true purpose was.